There's a reason why I LOVE to blog. Want to know why? It's YOU! Yes, YOU all inspire me! 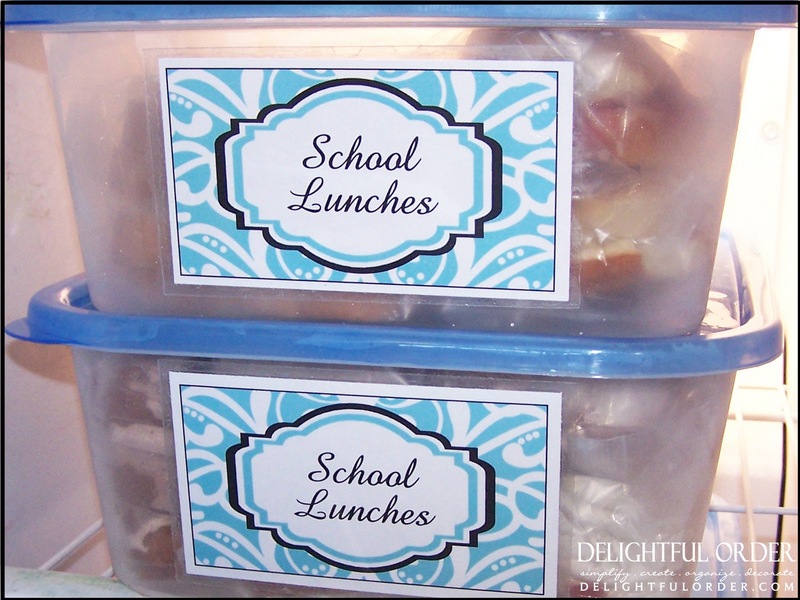 It wasn't too long ago that I posted on preparing school lunches ahead of time. You may remembering reading that post. If you missed it, you can view it HERE. 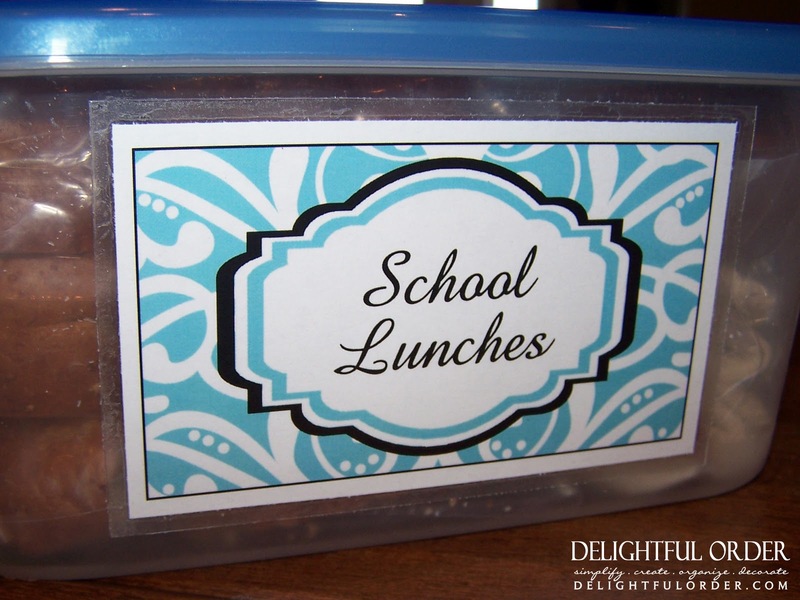 At the end of that post I had asked you all to share your tips and tricks on organizing lunches. My very first comment came from Rachel. She said that she makes sandwiches ahead of time and freezes them. Her great suggestion was to put the peanut butter on both slices of bread (one side lightly, just to seal it from the jelly) and when preparing meat and cheese sandwiches to put the condiment between the meat and cheese. Brilliant, genius - you are so smart Rachel!! Thanks for the advice. I was SO EXCITED about that awesome tip, so you know what I did right?! I made a bunch of sandwiches for the freezer. I've been doing this now for about a month and it is the BEST thing e.v.e.r. Our school mornings are such a breeze. I found these containers at the Dollar Tree. They are good for the freezer too. Not all of the ones at the Dollar Tree are for the freezer, but these ones are. I designed and printed the labels. Laminated them and slid them through my sticker maker. 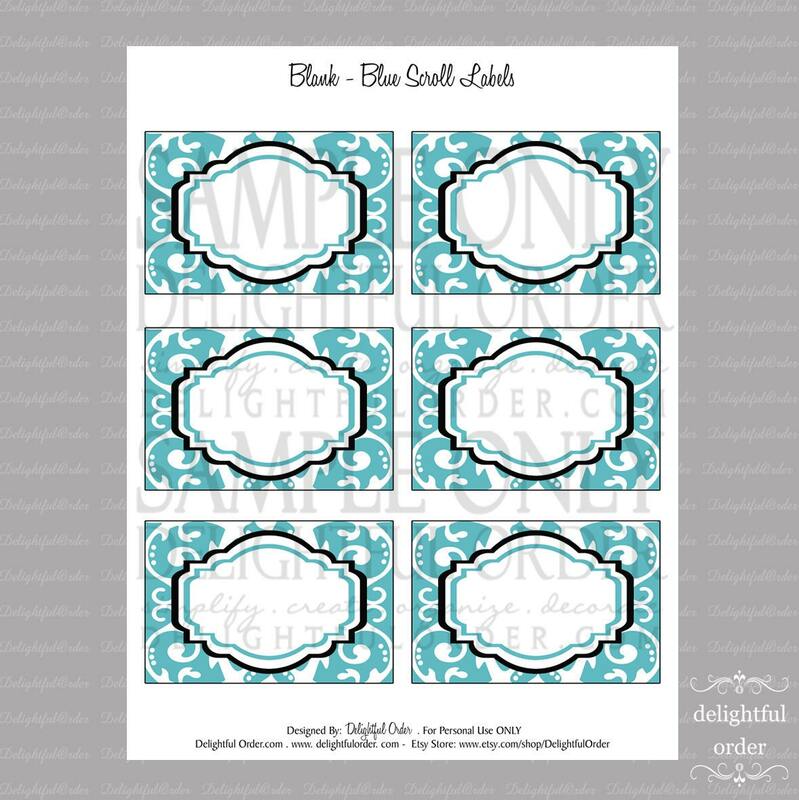 I've talked about my sticker makers in my Coupon and Receipt Organizing Post and in my Craft Room Closet Organizing Post. and store them in my garage freezer. I've got two containers, one for meat and cheese sandwiches and one for peanut butter and jelly sandwiches. Each morning, I (or one of my boys) go into the garage, grab a sandwich bin from the freezer, and a tray from the refrigerator, bring them into the house and pack them into the lunch boxes, which takes a couple of minutes. It's so sweet! That's it, I just wanted to share some time saving tips for those busy school mornings. Yes, making the lunches ahead of time takes a little prep time in the beginning of the week (or on the weekend, which is what I've been doing.) BUT it is so worth it come Monday through Friday. Do you have an awesome time saving tip for school mornings? Have you blogged about it? Please share, so we can ALL benefit from them. the frozen sandwiches are a great idea! they're just like the pb&js you can buy at the store and then pack them frozen and they're perfect by lunchtime. 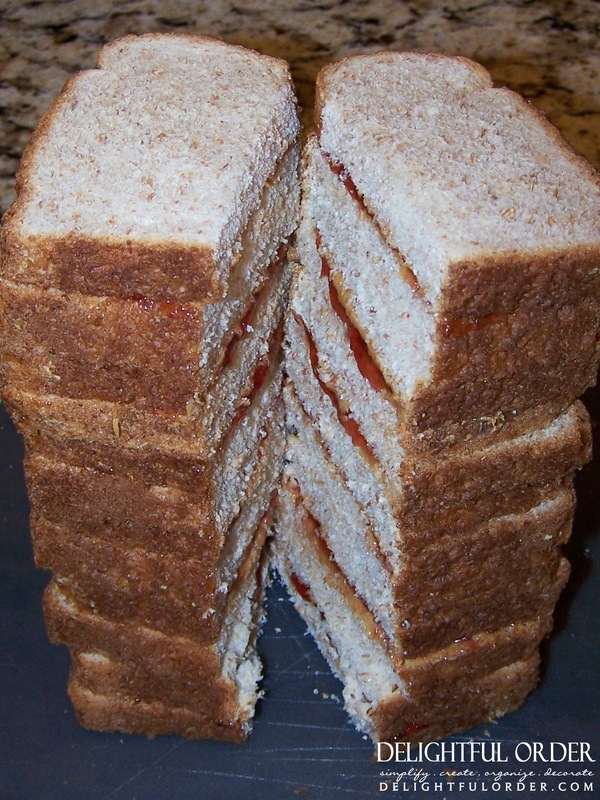 do you ever have a problem with the meat/cheese sandwiches getting soggy when they thaw out? I also prep my dinners ahead for the week so this made sense to me! Absolutely brilliant!!! I am copying this tonight! GENIUS!!!!!!!! I've never heard of freezing sandwiches.... what a great idea!!! Your bins and the labels are soooo pretty!! This is FABULOUS!! I've heard of weekly prep, but freezing sounds perfect! I'm assuming the sandwiches thaw in time for lunch?? I'm curious about the sandwiches - do they thaw in time for lunch? I would LOVE to be able to do this. How long will they freeze for? Just stumbled on your blog and am so excited to try some of these things! 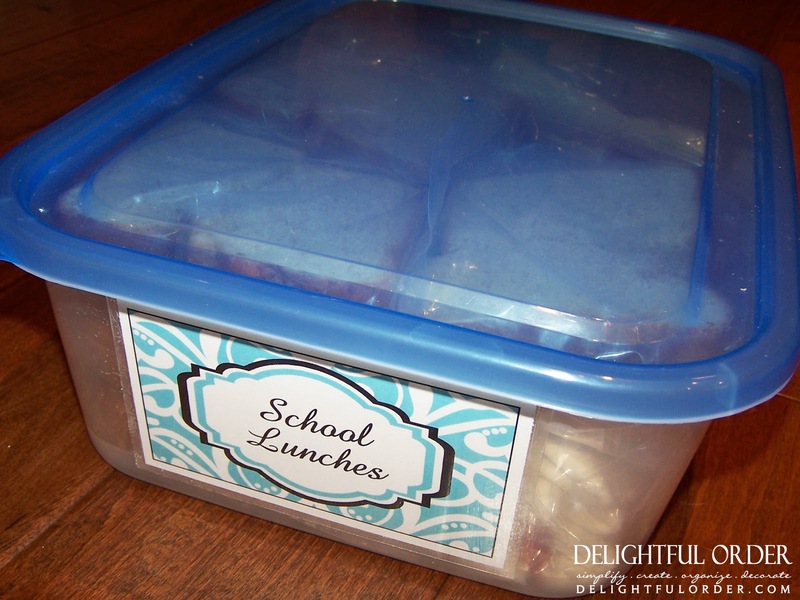 Yes, the sandwiches thaw in time for school. My boys say they taste great. I'm not sure how long you can freeze them for, but I freeze them for at least a week. What a brilliant idea! With 3 kids in school this would surely make my life TONS easier in the mornings! 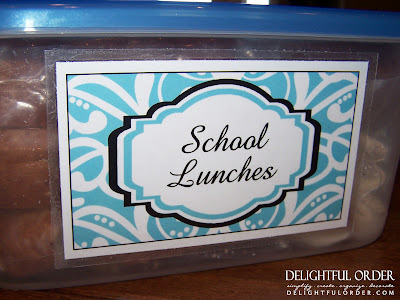 I feel so guilty throwing a nasty lunchable in their lunch bags on my lazy mornings...which is more often than not! I'm definitely going to use this! Thanks a bunch! Made with marshmallow fluff and peanut butter! oh yeah... my boys LOVE fluff. Can't find it around here, but Marshmallow Creme works too. :) Forgot about that one. I have one picky child in first grade right now, and her brother starts school this Sept., I run out of time in the am just trying to pack for her, so this is something i will definitely be using this year, this is also great if we have a long car trip (example 5 hour drive to beach this summer) or a trip to the park....so simple, yet soooo great!!!! Nice :) So the meat/cheese ones stay pretty well in the freezer? Yes. My children have enjoyed them. I like the idea of the non-sandwich items already assembled in the fridge as well, but how do you manage to devote space in your fridge to all that stuff? Is there some secret to organizing it? I have an extra fridge in the garage and that's where these go. If I didn't have the extra fridge, I wouldn't be able to do it this way. Another idea would be to keep the non-refrigerated items in a basket separated, like I have and keep the basket in a pantry... OR you could fill paper school lunch bags and store those in the pantry too and just pop a sandwich from the freezer straight to the bag in the morning. This is such a great idea! I definitely have to try it. Thanks for the tip! Is the bread soggy when it thaws? Like this idea if the bread tastes fresh... Also as a mom of a child who is anaphylactic to peanuts it's always a good idea to check if any kids have allergies in the class... I used to feel put out when not being able to send pbj's to school but now that one of my kids could literally die from being in touch w/ peanuts I pray people take it seriously and are understanding. I just found your blog through pinterest. What a delight, indeed! I am a wife, mother of 4 boys, preschool teacher and part time student. I have to be organized or else my family and I would live in chaos and filth. Well... It is a little chaotic, but clean and organized. I wish that I had a 2nd fridge in the garage, that would be great! I have to use a small space in our kitchen fridge for prepared lunches. I prepare 4 lunches for two of my children every week. 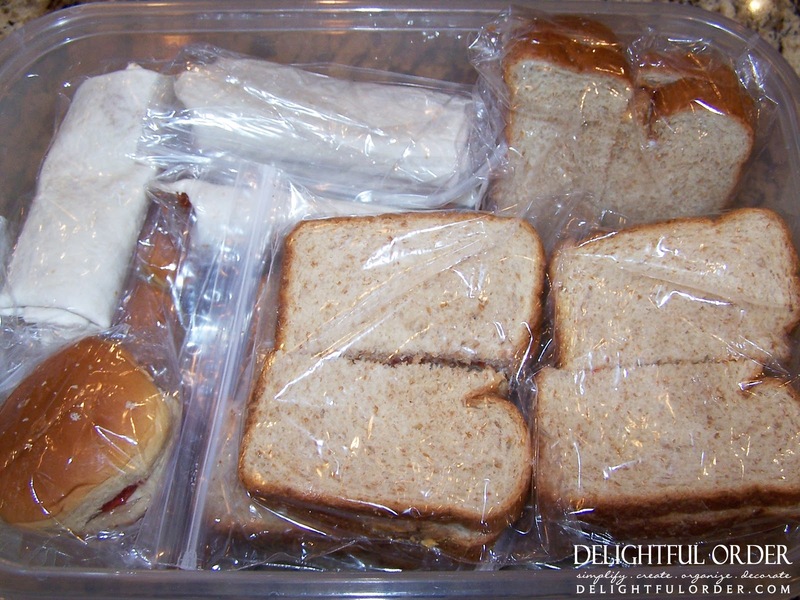 I make 8 sandwiches on Monday morning , then put together 8 lunches in 8 different freezer bags. 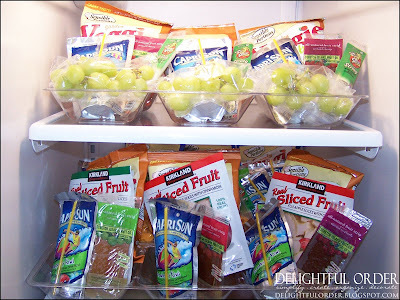 I switch up the snacks a little in each one. In the morning, my kids get their lunchbox and choose a bag from the fridge to put inside. The bags allow them to see what is inside and it keeps everything together. I store them in a plastic container on the bottom shelf. The sandwiches stay fresh all week . Have you ever tried freezing pb and honey?? Just curious, my kids like that better than pb and jelly! I have, no problems! I put them in zip locks and then put them all in a freezer bag. I love this, but I try my best to use reusable containers so as to not use disposable bags. But that would take up a lot of freezer space! Do you have suggestions for streamlined reusable containers? I use one or two full loaves of bread when I make pb&j's for the freezer. I just put them right back into the bread bag! Takes up much less space and I can just open the bag up in the morning and toss a sandwich in a baggie or a reusable container. I only have one in school and she like to eat school lunch one day a week. I only have to make 4 lunches a week. I only use containers to pack all of the lunch items in. I have picked up several reusable sandwich containers from the Dollar Spot at Target and the Dollar Tree. I also have a large collection of small reusable containers. To save money I do not by the single serving portions of things like fruit, apple sauce, or other lunch things. I get the big jar/can and put it the little containers. I make it all up on Sunday night and put it in the fridge. I simple take what I need out of the fridge the night before and put the lunch sack in the fridge. My daughter grabs her lunch and puts in an ice pack in the morning. Works like a charm!